In November and December of this year I wrote a 4 part series of articles for Legacy Family Tree on Organizing, Scanning, Preserving and Sharing Family Photos. 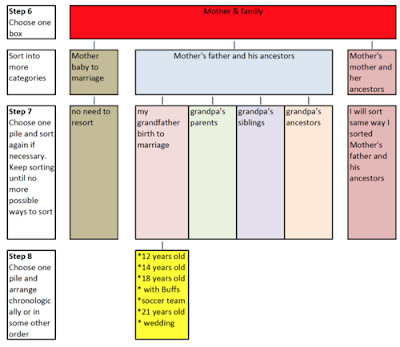 They may be helpful for any of my readers wanting to create some structure and organization out of a mess of family photographs! I've followed my own advice and made giant leaps in my own chaos of shoeboxes of stored family photos and old photo albums tucked into corners of the attic. 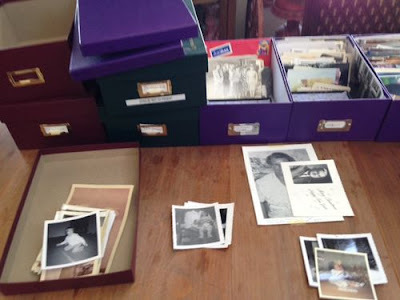 In "10 Easy Steps to Organizing Family Photos" Part I and Part II I will walk you step by step through easy ways to sort your family photographs and get them ready for scanning. Graphics such as the one I created below add a visual component to aid in following the steps. In "10 Steps to Scanning, Preserving and Sharing Your Photos" Part 1 and Part 2 I explain resolution, file format, types of scanners and other details you need to know before you begin to scan those treasured photographs. You've probably heard of meta data but might not know what it is. That is all explained in my series and screenshots of using meta data will be helpful. Sometimes your timing with articles is spot on! I've been trying to organize my family albums going back to the 1800's and found I was just getting myself more and more confused as to how to set them up so that it follows a logical pattern. I got very frustrated and confused this morning, so I logged on to facebook to play scrabble and clear my brain and looky here----- this article. Perfect! Thank you! I was surprised to see no mention of using the numbers and/or codes on the backs of photos to organize them back into their original rolls. I've used this method several times and it is invaluable for putting context into a series of photos. This helps date and identify people, events, etc. If you separate out your photos by person or family, you will miss this context altogether... and lose opportunities to identify locations and timeframes for photos of people that seem to have no context or dateable info on them individually. In the case of my wife's grandmother's photos, we actually had envelopes with processing code numbers and dates of development on them. We found all the photos with same code numbers on the back and we were able to reconstruct the original roll and we had the date for it! Just matching the numbers on the backs of the photos is enough for reassembling rolls from the 1960s and before. Don that is a sound idea for more recent photos IF they have such numbers. I've never seen any numbers on any of my photos even my very recent ones. Also your suggestion goes along with what I always tell my readers to do when they acquire an album of photos - photograph all pages BEFORE you start removing and organizing them. That retains the context of the original album. I would use your idea as a first step before sorting and organizing - again, IF the photos have such numbers. I'm interested in knowing more about what numbers and/or codes Don Bowman is referring to. Do such numbers pertain to a professional studio's filing system? In that case, it may be possible to find the studio's records and establish dating information from that. The only numbers I'm aware of on modern (color) prints usually refer to color filter settings on the printer and possibly which of several processing machines processed a particular roll of film. Older prints, especially black-and-white ones, sometimes have the name of the particular printing brand of paper, such as Kodak's "Velox", printed in a pattern on the back. Since prints, which were usually printed on a single, continuous roll of paper, did not always line up precisely with this pattern when they were cut apart, it is sometimes possible to determine the sequence of prints from a particular photo event by aligning the printed names on the backs so that they match. However, that alone will not tell anything specific about 'when' the shots were taken, only which sequence they occurred on the roll of film. Since many families could not afford to shoot a lot of film in earlier decades, a single roll of film might well contain photos from one Christmas until the next Christmas, along with possibly several birthday parties and one or more vacation sequences. There may be information visible in the subject matter to help establish a time, date, and sequence for a group of photos, especially if they have remained together, either in an album or likely in the envelopes they were received in from the film processing lab. Some labs did print a processing date in the white border of black-and-white prints, but as indicated earlier, that may or may not have any relationship to when each shot was actually made. In my collection, I have at least one shot with a processing date of 'Dec. 57' but the vegetation and the clothing I'm wearing are more likely to have been shot in Spring or Fall than December. Judging by my apparent age in the shot, it probably was made in 1957 but the December part of the date is very unlikely. In the case of color slides, many labs did print or emboss the month and year of processing on the paper/cardboard or plastic slide mount, but again, that would indicate only the processing date. Some avid amateur, and some pro, photographers have been known to shoot several rolls of 36 exposure film in one day but send them in for processing over a period of several days to reduce the chances of any kind of damage happening to all their shots. If the photographer has manually written or rubber-stamped the exposure date on the slide mount, or used a camera with a data imprint capability which has exposed the time and/or date of exposure on each frame of film, it is obvious when such images were made. Some cameras printed such data on the narrow black rebate strip between frames so it would not likely be visible on mounted slides. Other cameras printed the data within the image area so it would always be visible. However, in either case, just as with modern digital cameras, if the time and date are not correctly set in the camera (e.g. forgetting to compensate for Daylight Savings Time or different time zone when traveling, the information may not be correct. Some of our precious memories get lost because of poor storage solutions that we practice at home. If they are not stowed away properly, they might get dilapidated down the road due to nature and we are going to regret it. Did You Read the Most Popular Posts of 2015? Flatbed Scanners - Which One is Right for You?